The owner of the Honolulu Star-Bulletin announced today it will shut down the state's second-largest newspaper, closing the book on a 117-year daily that witnessed the overthrow of the Hawaiian monarchy, World War II and the emergence of Hawaii as a state. Florida-based Liberty Newspapers Limited Partnership told employees of the 67,124-circulation Star-Bulletin that the newspaper will print its last edition on Oct. 30. The shutdown includes the paper's online edition, starbulletin.com. Rupert Phillips, general partner of Liberty Newspapers Limited Partnership, blamed the move on declining circulation, a sluggish local economy and better investment opportunities on the mainland. "The staff produced a very good newspaper but the market no longer supports an afternoon newspaper," Phillips said. "Unfortunately, the Star-Bulletin's continuing circulation decline over many years led us to the conclusion that improved results were not possible." As a result of the closure, the Star-Bulletin will lay off its staff of 90. Also, the Hawaii Newspaper Agency, which handles circulation and delivery of the Star-Bulletin and the Honolulu Advertiser, will eliminate about 50 positions. staffers that the paper will close at the end of October. Michael J. Fisch, president of the Hawaii Newspaper Agency and president and publisher of the Honolulu Advertiser, said he was "surprised by the timing" of today's announcement. "We didn't expect it. We're saddened. Anytime a newspaper goes out of business, it's a huge loss ... especially for the community." The agency, which is the production arm of both the Honolulu Star-Bulletin and Advertiser, will change its name in mid-January, Fisch said. "All the employees will become employees of the Honolulu Advertiser," he said. Fisch said that beginning Nov. 1 the Advertiser plans to increase its news space, increasing the daily newspaper by 40 columns and adding an additional six to eight pages to the paper from Monday through Saturday and two to three on Sunday. Fisch estimated the Advertiser will hire 20 to 30 Star-Bulletin staffers. The Honolulu Advertiser also has plans pending before its corporate headquarters in Virginia to remodel its building at 605 S. Kapiolani Blvd. beginning late next year. Since 1962, the Star-Bulletin and the Advertiser operated under a joint operating agreement that allows the papers to share circulation and delivery costs while keeping distinct editorial voices. The agreement, which had been vital to the future of the Star-Bulletin, had been scheduled to terminate in the year 2012, but Phillips said he and his partners approached Gannett recently about a buyout of their position. As part of the buyout, Liberty essentially gets back its initial investment in the Star-Bulletin; it bought the paper from Gannett in 1993. Previous news stories had disclosed that Liberty paid about $15 million for the Star-Bulletin. The undisclosed termination payment is based on savings Gannett could expect from being relieved of its JOA obligations. Phillips declined to say whether Gannett agreed to pay a premium on top of Liberty's initial investment to end the joint operating agreement prematurely. Tom Brislin, chairman of the University of Hawaii's journalism department, said the closure of the Star-Bulletin reflects readers' preference for a morning newspaper. During the early 1960s, when the Star-Bulletin was the dominant newspaper with a circulation of about 120,000, many of its readers worked in the agricultural industry and were geared toward reading a newspaper in the afternoon. "This isn't a plantation town anymore," Brislin said. Brislin noted that the Star-Bulletin recently distinguished its approach by emphasizing on investigative reporting. In recent years, the Star-Bulletin published the "Broken Trust" essay that inspired the attorney general's investigation of the Bishop Estate trustees, and award-winning series on local government secrecy, Hawaii's economic problems, questionably high gasoline and consumer prices, and the power of Hawaii's public employee unions. "This means we're not going to have a competing editorial voice. I think the last couple of years have shown that the community needs open discussion of different points of view," said Senior U.S. District Judge Samuel King, a co-author of the "Broken Trust" article. Media analysts say the demise of the Star-Bulletin reflects a trend of fewer and fewer afternoon dailies. John Morton, a longtime media consultant and newspaper analyst, noted that in 1989 there were 1,125 evening newspapers in the country. As of last year, that number has dwindled down to 781, said Morton, president of Silver Springs, M.D.-based Morton Research Inc.
Morton said it's surprising that Gannett and Liberty agreed to terminate the joint operating agreement at this point. Typically, a newspaper will terminate a J0A when the circulation of its weaker partner drops to about one-fifth of the dominant competitor. That recently occurred in San Francisco when Hearst Corp. and Chronicle Publishing agreed to end its JOA after Hearst acquired the San Francisco Chronicle. The closing of the Star-Bulletin comes at a time when Hawaii's economy is in the midst of its deepest recession and the job market has been sluggish. The parent of Bank of Hawaii, Pacific Century Financial Corp., on Monday's announced that it would eliminate more than 1,000 positions and lay off about 260 workers as part of corporate-wide redesign. An airport services company, Signature Flight Support, last week announced it was shutting down and eliminating 135 jobs. The Sun Press, which operates several neighborhood newspapers, also announced it was ceasing operations next month. 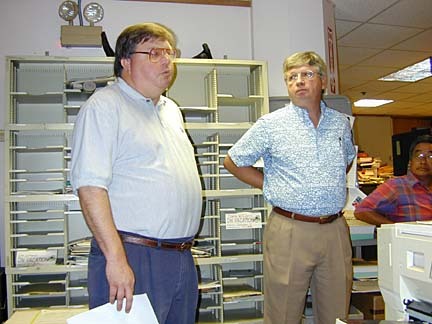 David Shapiro, the Star-Bulletin's managing editor, lamented the passing of the newspaper, saying the daily continued to excel over the years despite staffing shortages and the possibility of a closure. The Star-Bulletin won 12 top Excellence in Journalism awards in this year's competition sponsored by the Society of Professional Journalists, three times more than any other local newspaper. The Star-Bulletin won 15 of the Hawaii Publishers Association's Pa'i awards this year, more than twice as many as any other newspaper. "The Star-Bulletin was born in the 20th century," added Bud Smyser, contributing editor and former top editor of the newspaper. "It will die in the 20th century. And in between it lived a good life." Star-Bulletin subscribers will have the opportunity to request a refund for payments that go beyond Oct. 30, or to apply their payment to a Honolulu Advertiser subscription, said Dennis Francis, general manager for the Hawaii Newspaper Agency. Francis said subscribers will be receiving letters describing the options. 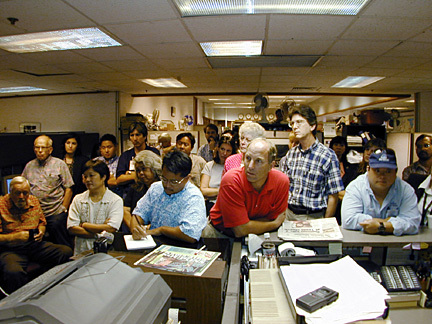 Inside and outside the newsroom, people today lamented the end of a chapter in Hawaii's history, with the announcement that the Honolulu Star-Bulletin will cease publication on Oct. 30. "The Bulletin for a hundred years has led the community in very important issues, like statehood, like fighting against censorship during World War II under the military government," said Helen Chapin, author of "Shaping History: The Role of Newspapers in Hawaii." "It's an afternoon paper, so it performed its function of being the paper that working people read after work. The business people read the morning paper. So it's been very important in Hawaiian history." Retired Federal Judge Samuel King was one of five authors of the "Broken Trust" editorial essay in the Star-Bulletin, which helped unleash an investigation into Kamehameha Schools Bishop Estate in 1997. The Bulletin printed the article after the Advertiser declined to do so. "I think it's terrible; that means we're not going to have competing editorial voices," King said. "I think the last couple of years have shown that the community needs some open discussion of the different points of view." Ousted KSBE trustee Henry Peters, who's criticized his coverage by newspapers over the years, said he has mixed feelings about the closing. "I'm frightened by the prospect of not having balanced reporting in this town," Peters said. "I still thought that the Star-Bulletin and Advertiser were too close, but at least there was another alternative." But not all were dismayed to see the paper go. Former Mayor Frank Fasi stood in the Newspaper Building parking lot and told a live television audience that the joint operating agreement he long sought to vanquish finally is gone. Gov. Ben Cayetano, who could not be reached for comment today, said last month he doesn't care if one of Honolulu's daily newspapers folded. "I could care less if there is one or two papers in the state," Cayetano had said. Star-Bulletin staffers tried to contemplate the larger picture of what the closure means to Hawaii rather than their personal plights. "People in this community should realize they're losing a lot of good friends," said Cynthia Oi, a reporter and editor for 23 years, "people who were out there every day trying to help them make their lives better while still having fun." Lucy Young-Oda, has been with the paper for 17 years, starting as an intern and working her way up to editor positions including city editor. "Working here has been both a career and a second family for most of my adult life," said Young-Oda, now art and special projects director. "It's been an honor working with these people who, day after day, year after year, work so hard in what we believe is so important: the people's right to know." Added Oi: "We are a really close group of people. It's not a job; it's a calling. It's a life." Writer June Watanabe contributed to this report. The Honolulu Star-Bulletin -- the oldest continuous daily newspaper in Hawaii -- will end a proud history of fighting for truth and principle when it publishes its final edition Oct. 30. Its recent slogan, "We Make Waves," might well have been coined when the Evening Bulletin first appeared in 1871. Typewriters have given way to fancy computers and other modern devices. Yet, the Star-Bulletin has consistently fought for a strong economy, education and people's rights. It was a staunch advocate of statehood to give Hawaii residents equal treatment with other Americans and has waged battles to protect First Amendment rights and maintain an open and honest government. During World War II, publisher Walter R. Farrington and editor Riley H. Allen prohibited use of the abbreviated word for "Japanese." The Star-Bulletin also took the lead in urging lifting of military censorship and martial law after the Battle of Midway in June 1942. It began its colorful history as simply a "bulletin." Henry M. Whitney, editor and book merchant, recorded arrivals and departures of ships and mails, passenger lists and other items of local interest in a hand-written bulletin posted in his stationary shop. J.W. Robertson & Company bought Whitney's business in early 1882 and put out the first printed issue of the daily bulletin on Feb. 1, 1882. It was one page, four columns wide. On April 24 of that year, the paper was enlarged to four six-column pages. Thus was born the Evening Bulletin. Wallace R. Farrington became editor of the Evening Bulletin in 1898, two months before Hawaii was formally annexed to the United States. The Evening Bulletin and the Hawaiian Star, founded March 28, 1893, were consolidated to form the Honolulu Star-Bulletin on July 1, 1912, and Farrington became president and publisher. His son, Joseph R. Farrington, succeeded him as president and was general manager. Joseph Farrington was elected as Hawaii's delegate to Congress in November 1942, and was re-elected continuously until he died of a heart attack June 19, 1954. Under the Farringtons' guidance, the Star-Bulletin was said to have a "liberalizing" effect on "the conservative, closed oligarchy of Hawaii." Star- Bulletin staffers listen as the announcement is made. Riley H. Allen, who joined the Star-Bulletin in 1905 and was editor from 1912 to 1960, said Joseph Farrington gave his life to the fight for statehood. Farrington's wife, Elizabeth, became president of the Star-Bulletin upon his death but resigned Nov. 21, 1961, in opposition to the newspaper's sale to Chinn Ho, Alexander S. and J. Ballard Atherton, William H. Hill and John T. Waterhouse. Financier Ho, previously a director of the Honolulu Advertiser, was the group's enthusiastic leader. He felt the only way Honolulu could continue to support two major newspapers was to combine production facilities. So on June 1, 1962, Star-Bulletin and Honolulu Advertiser executives formed the Hawaii Newspaper Agency to handle production for both newspapers. Management of the Star-Bulletin shifted to the mainland when the Gannett Corp. bought it in August 1971. Veteran newspaper executive L. Porter Dickinson succeeded Elizabeth Farrington as publisher in 1962 and was followed by James H. Couey in 1971. Couey died three months later of a heart attack. Gannett named John A. Scott, retired reserve Marine general and mainland newspaper publisher, as the Star-Bulletin's publisher. Philip T. Gialanella, with the Gannett Group on the mainland, was named executive vice president and general manager. He became Hawaii Newspaper Agency president in January 1974 and succeeded Scott as the Star-Bulletin's publisher on Oct. 31, 1975. In January 1993, Gannett officials shocked the Star-Bulletin staff with an announcement that they were selling the afternoon newspaper and buying the Honolulu Advertiser from Thurston Twigg-Smith. Gannett paid $250 million for the morning newspaper. The Star-Bulletin, which once had a 120,000 circulation, had declined to 88,000 at that time. The Advertiser's circulation was 105,000 but the Star-Bulletin maintained a larger home subscriber base. Liberty Newspapers, controlled by Florida investor Rupert E. Phillips, bought the Star-Bulletin for undisclosed terms. Phillips, who owns a string of mainland newspapers, promised the Star-Bulletin at least 20 more years of life. Financial considerations cut that to six years.